Choose a permanent reunion date! To read the complete article, “The Three Keys to a Successful Family Reunion” , follow the link below. "Three Keys to a Successful Family Reunion"
This weekend I planned a fun two-day party at my house for 25 of my favorite family members. We planned to go horseback riding, play Badminton, Human Foosball, watch a movie and sleep outside. Fifteen minutes before the party was to begin, with no warning, the winds came up and the rains came down, and the thunder started booming. I’m actually amazed that I didn’t begin crying but with a few adjustments we were able to have a very fun party. Every outdoor reunion or party should have an alternative plan, in case the weather becomes uncooperative. When planning a family reunion it isn’t always reasonable to cancel the reunion or reschedule, instead you need to have a “plan B”. 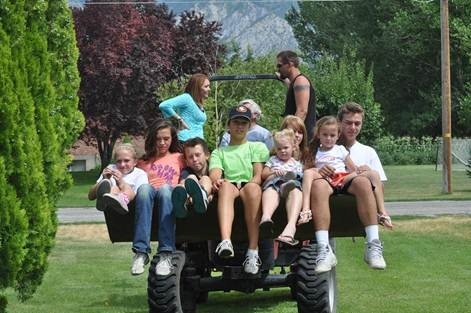 I remember a family reunion we attended in Delta, Utah many years ago. The reunion was held at Great Grandma Stanworth’s tiny home and so everyone brought their tents and trailers to camp out. The reunion was great fun until the wind started blowing. It blew so hard that the tents were laying flat on the ground and we couldn’t even talk to each other because our words were just blown away. If you don’t want to pack up and go home when the storm hits, that’s the time to plan for another activity. If you’re close to a town, take everyone bowling, to an indoor pool or a movie. Hopefully, two hours later, the wind will have died down. If not, stop at a restaurant or fast food place for an ice cream treat or a full meal. If the weather still isn’t cooperating stop at a park with a bowery and play a few games. We played a fun new game at our “outdoor” party this weekend. It’s called “The Couch Game”. Directions and rules for playing the game can be found at www.familyreunionhelper.com/ but basically, you split into two teams, boys against the girls, and through strategic maneuvering, try to get four of your teammates sitting on the couch. 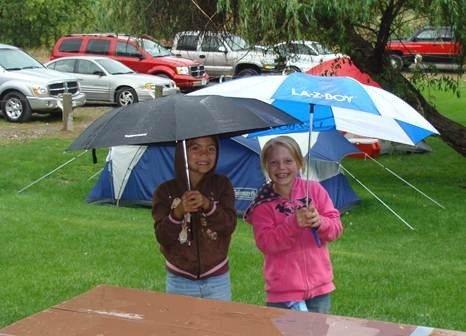 A couple of years ago we had rain at our big Stewart reunion. The weather did shut down a few of our planned activities but we were lucky because our reunion location included a huge bowery with an indoor kitchen. Everyone stayed in the bowery and we played a lengthy game of Bunko and ate dinner until the storm blew over. Portable, easy-to-setup pavilions are a great solution to keep family members out of the rain and provide shade even on bright sunny days. 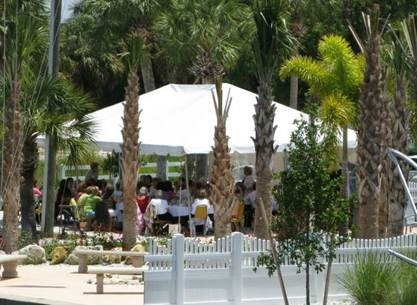 Unless there is a major storm, good family reunion planning dictates you provide your guests with shelter from the rain. Many of the gazebos on the market will provide adequate shelter unless you are hit by a major storm. Renting a big tent can be very expensive; in fact sometimes I think it would be cheaper to just buy one that you can count on having every year. In our area you can plan on paying $495.00 for 30×30 tent and they go up in price from there. I think a better option is to reserve an alternate location in advance. If your reunion site does not have a bowery or a rec hall of some sort, consider reserving a church’s culture hall or a school gym near your family reunion site. Our school rents their gym for $75.00 a day and our church’s gym is free but must be reserved in advance. We can rent our town’s civic center for $50.00 a day. 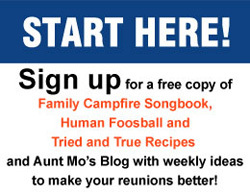 Plan backup activities if rain pushes your family reunion inside. 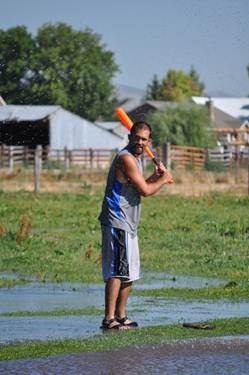 If your outside activities have been washed out, planning alternatives will keep your family busy. Plan on setting up a minimum of three stations (activities) at different places. Divide the family into three groups and then rotate them from activity to activity. Each activity should take 20 to 30 minutes but each should last the same amount of time. Do a craft at one station, have story time at a second station, play a game at the third station. You could ask three different members of your family to plan a “rainy day” activity to be used “just in case” or use the activities you have already planned for your reunion and move them inside. Having a table set up with various paper, markers and scissors and encourage family members to make cards for family members that weren’t able to attend the reunion. Have each family group draw a family portrait of their family, give an award for the best family portrait and then hang all the portraits up for the remainder of the reunion. You will need colored pencils and paper that is at least 11×17. Have someone tell a story. Put on an impromptu play or melodrama. Pass out copies of the script and the actors improvise as they go along. Just because it’s raining doesn’t mean you have to stay inside. P ut on some waterproof gear and play volleyball, football or whiffle ball in the rain. Relay races or tag games can be extra fun in the rain. So back to my fun outdoor summer party- we rescheduled a few of our plans; we ate dinner first and rode horses last. We postponed playing Human Foosball until day 2 but we did manage to work in everything we had planned (right down to cooking S’mores over a fire the first night) even added a few unplanned things like playing with the neighbor’s 6 puppies and giving rides on the tractor. Every person in charge of planning a family reunion is hoping that rain, rain will just go away, but with a little extra thought and a good “plan B” your family reunion will keep on going, even in stormy weather.